I’ve been a fan of M83 ever since the summer that Saturdays = Youth came out. Their music felt like something I’d been searching for my whole life. Reminiscent of 80’s synth and shoegaze, M83 was a sound that felt like it could have been the soundtrack to my teenage years. When I heard that Anthony Gonzales, the creative mind behind M83, was tasked with scoring the next movie by Tron Legacy’s director, I could not have been more excited. I’m a huge fan of Tron Legacy and I grew up loving the original. While many don’t agree with my positive sentiment towards Tron: Legacy the film, everyone pretty much agrees that the Daft Punk score is one of the the best done for any movie. So the prospect of a band I love working with the director of Tron Legacy on his new film was like a match made in heaven…that is until I walked out of those theater doors earlier today. I write this review mostly for the purposes of letting people know that this is NOT the next M83 album. It is a score for an action/adventure sci-fi movie starring Tom Cruise. Although it is composed and orchestrated by the leader of M83, this is not an M83 album. A majority of this score isn’t reminiscent of him in the slightest. A few tracks feature some synth and drumbeats that sound right out of an M83 album, but a lot of it is just generic sci-fi movie orchestral music. The moments where M83’s sound shine through are the highlights of the score, but they’re few and far between. Where Daft Punk was able to create some great orchestrations mixed with their techno/dance sound, M83’s influence is sparse at best. While watching the movie I pretty much forgot that the guy behind M83 was responsible for the score. From a few interviews I read with Anthony Gonzales, he had a little creative control over the sound of the score in the end. While he still created the music and orchestrations with Joseph Trapanese, he said studio executives steered him to make it sound a specific way, leaving little to no room for M83’s sound. In his interview for Pitchfork he even says that he wanted to leave the M83 moniker out of it and be credited solely as his real name. Though due to his recent popularity with “Midnight City”, the studio wanted to put M83 as the composer as part of the film’s marketing. It is apparent that Gonzales did approach this project in a different way than an M83 album, and it’s a shame that an expectation has been set with it because marketers wanted to associate the score with “Midnight City’s” accolades. Had he been given more creative control, it could have been something epic. That said, the movie itself is pretty mediocre and it would have been a waste to have such a brilliant score accompanying it. This isn’t an M83 album, and if you buy this solely for that reason, you’ll be disappointed. My going in expecting a score sounding similar songs like “Don’t Save Us From The Flames” or “Moonchild” probably have something to do with much of my disappointment. Though even then, looking at it solely as a movie score, it’s still a pretty mediocre work. It sounds too similar to Hanz Zimmer’s work with Christopher Nolan in many parts and even reminded me a bit of Tron’s orchestral parts too. The final track is probably the best part of it, though it would barely pass as a B-Side on an M83 album. Though it’s not offensively bad or anything like that. It’s definitely something I’d just have on in the background and not really seriously listen to. No doubt it won’t get nearly as many plays as Tron: Legacy, Moon, Inception, or the Dark Knight Trilogy scores on my iPod. 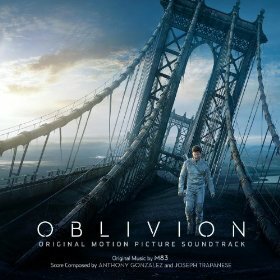 In the end, this not the next M83 album, it’s a score by Anthony Gonzales for a Tom Cruise sci-fi action movie. That’s not to say that action sci-fi movies can’t have quality scores, it’s just this one should have been better because of the caliber of musician behind it. While it doesn’t seem like Gonzales is fully to blame for the final product, it’s sad to see his creativity cut short by studio execs. I’d ask them, why even hire someone like the man behind M83 if you’re not going to let him do what he does best and create a stellar score? I look forward to the day that a studio lets Mr. Gonzales have full creative control over a score. I just hope that when he is allowed such creativity that it gets paired with a movie that is not a boring mess like Oblivion.